The Little Crooked Cottage : Mr. Pig LIVE . . . with Lady Pancake & Sir French Toast! Mr. Pig LIVE . . . with Lady Pancake & Sir French Toast! Welcome to my hit talk show, MR. Pig LIVE! We have a delicious, er, delightful show for you today. <<grumble>> Oh dear. Please excuse my growling stomach. I haven't eaten breakfast yet. 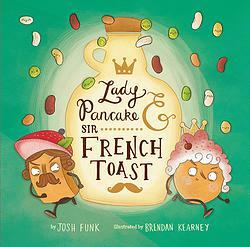 LADY PANCAKE & SIR FRENCH TOAST! Before we bring them out, let's watch these two in action. . . . Welcome, Lady Pancake and Sir French Toast! It's nice to eat you-- ah, meet you! LP: My full name is Grand Duchess of the Deep Fridge, Noble Sovereign of the Top Shelf, the Illustrious Lady Pancake the 14th. 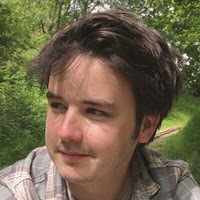 SFT: Technically my name is ‘Pain Grillé’. LP: Well, what one word describes you? LP: Well, that’s a lie. SFT: What did you say? Let'e move on. What are you reading right now? LP: The Fault in Our Starfruits. SFT: The Day the Crepes Quit. LP: Oh, give Mr. 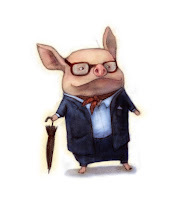 Pig a book for adults! SFT: That book is just as much for adults as it is for children! True. What's the best thing about being you? LP: There are so many fabulous things about me! I don’t think I could choose just one. SFT: The best thing about her is that she gets to spend all her time with me. LP: That wouldn’t even be in the top 50. LP: That I have to spend all my time with this smelly guy. SFT: You said you liked my rosemary scent! LP: One time I said it smelled good on the Squash, but you don’t have to bathe in it every morning! SFT: Well, I’m not gonna bring the rosemary any more. LP: Oh, you know me so well. 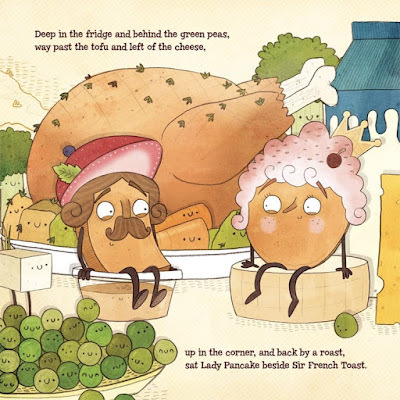 From LADY PANCAKE AND SIR FRENCH TOAST by Josh Funk. Illustration copyright 2015 by Brendan Kearney. LP: Well, that’s a bit of a personal question. I’d prefer not to answer that. Both: A lifetime supply of SYRUP!!! LP: I’d love to spend the day at Caramel Coast, watching the waves, just relaxing. LP: Yes! I was thinking exactly that! SFT: We should do that again. LP: I wish I could sing every note in existence. SFT: We would all love if you could sing little better. LP: What is that supposed to mean? SFT: Oh, just that, a sweet singing voice is always nice to hear. SFT: I just like the word! SFT: Oh, I hate that word! LP: I am one of three identical triplets. SFT: I am not afraid of sock puppets … anymore. LP: That’s a tricky question for such delicious foods as us. 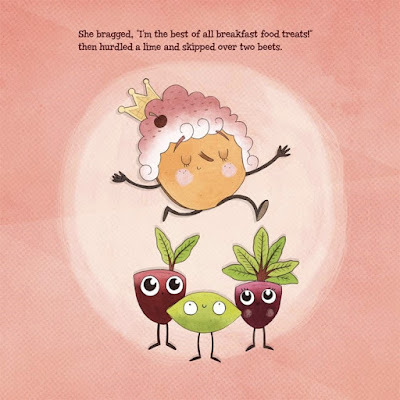 SFT: I think Arnie the Doughnut [by Laurie Keller] might be cool to hang out with. Things have seemed to work out for him. LP: Oh, and the Little Pea [by Amy Krouse Rosenthal & Jen Corace] seems nice enough. 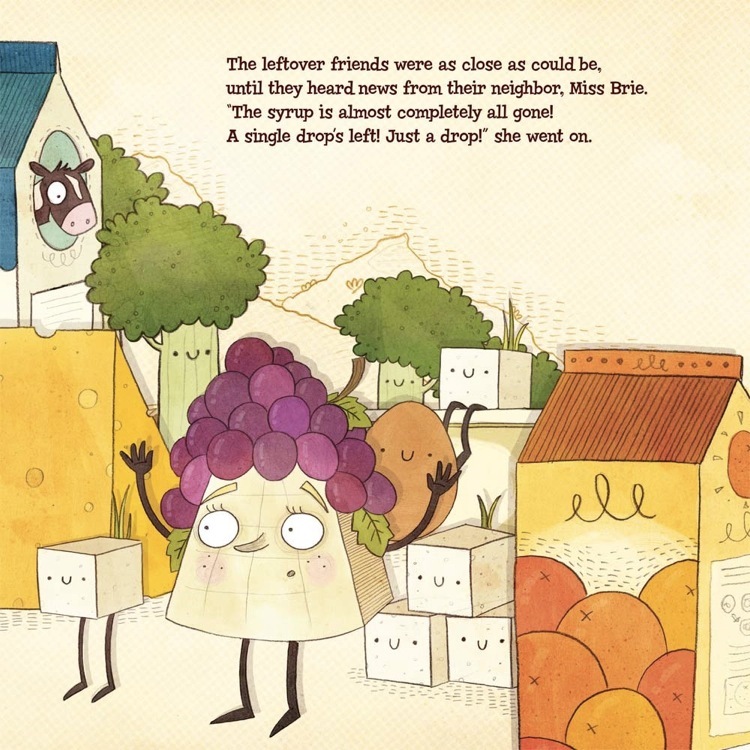 SFT: Maybe the Stinky Cheese Man [by Jon Scieszka & Lane Smith]? He seems like a cordial fellow. Let’s go with him. SFT: It’s really just a sensitivity. SFT: Remember the time when I told you that ants were invading the fridge and you spent all day hiding in the back corner with the Brussels sprouts but there really was no ant invasion cause I made it all up? LP: Yeah, that was – wait, you made it all up?!? I was down there with those stinky sprouts for hours! SFT: I didn’t tell you it was a joke? LP: At the moment … it is LIARS! SFT: Will you forgive me? LP: Okay. I can’t really stay mad at you. What was it like working with Josh Funk? LP: Josh Funk is the greatest human being in the history of the world. SFT: And he definitely didn’t force us to say that. Thanks for joining us! <<grumble>> Oh dear. That's my stomach again. It's a good thing our favorite caterer, Nina from Mamabelly's Lunches with Love has arrived with a Lady Pancake & Sir French Toast breakfast. Let's eat! Scroll down or click here to see Nina's masterpiece. "A tale of 'to-go' food that is good for you! ... Readers get a ringside seat ... on an edible version of American Ninja... the refrigerator morphs into a true Hunger Games arena.... Kearney's illustrations kick butter ... the bean avalanche is a trippy wonder ... while the acrobatic rhymes tackle the next hurdle... Teachers and students alike will delight in this food fight. Who will be the winner? Readers will be hungry to find out." 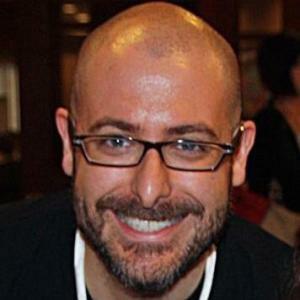 Josh Funk lives in New England with his wife and children. He is the author of LADY PANCAKE & SIR FRENCH TOAST (Sterling 2015), and the forthcoming picture books DEAR DRAGON (Viking/Penguin 2016), PIRASAURS! (Scholastic 2017), and JACK! [and the beanstalk] (Two Lions 2017). Find more information about his books at JoshFunkBooks.com. Brendan Kearney says, "Whilst studying Architecture at University I realized I didn’t like rulers. I also discovered that drawing pictures for a living was a legitimate and fun career option, and so traded architecture for illustration as quickly as I could. Having now completed my degree in Illustration I specialize in children’s books and artwork, bringing my own chaotic style and ideas to any project. If you can’t find me drawing you are likely to find me with a guitar or banjo in hand. I like mince pies. I don’t like carrots." He lives in England. To see more of Brendan's work, visit his website. thanks so much for inviting me. it's been enlightening discovering Lady Pancake & Sir French Toast's answers to these questions for me, as well! Thanks, Jama, for informing me of this blog. Love buying books for grandchildren!